Right click, Refresh! Not a lot more for the 2019 Nissan Murano. Nissan brought a refreshed 2019 Murano to the 2018 Los Angeles Auto Show. While the company dared to call it new, I can only say that the Murano received some superficial changes to get in line with the latest Nissan design philosophy. Despite its exterior looks, the 2019 Nissan Murano will fulfil its task of being an awesome family hauler masterfully. 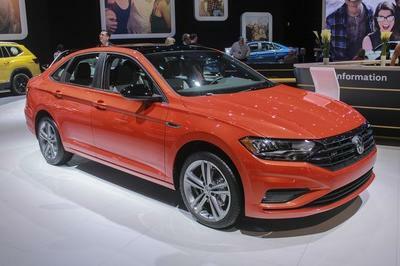 If you can recall, Nissan actually showcased a refreshed version only last year. True, changes included only modifications to the inside at the time. 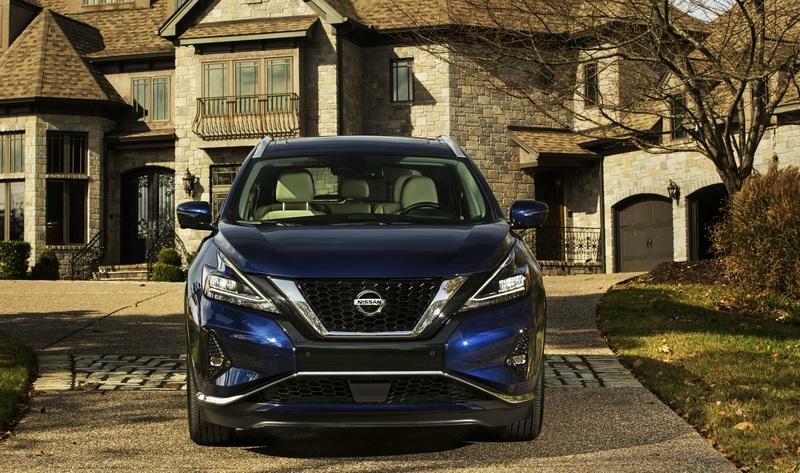 For this new 2019 Nissan Murano, changes are kept on the outside. What’s New For The 2019 Nissan Murano? 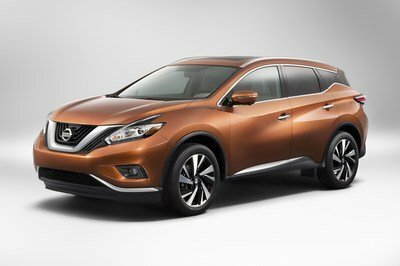 Taking the shape of Nissan’s latest design language, the Murano received a new V-grille. 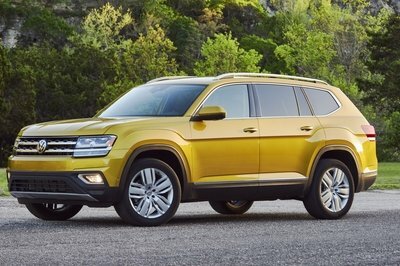 It is a more pronounced piece compared with the previous versions and complements the addition of new headlights. These now feature a whole new LED graphic. All the shapes on the front point in the middle area of the front end. It is almost like a Union Jack flag of Murano shapes. 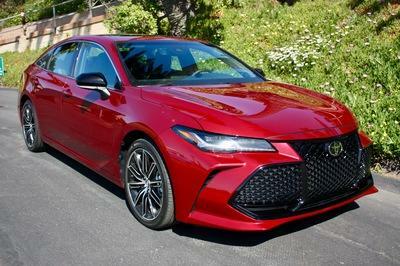 Honestly, with all the lines focusing on the center, one would expect to find something cooler there instead of a gloss black bumper piece with parking sensors on it. In spite of the somewhat strange shape of the front, the Murano did retain a tad of futurism that every single version has expressed since 2003 when the first one appeared. 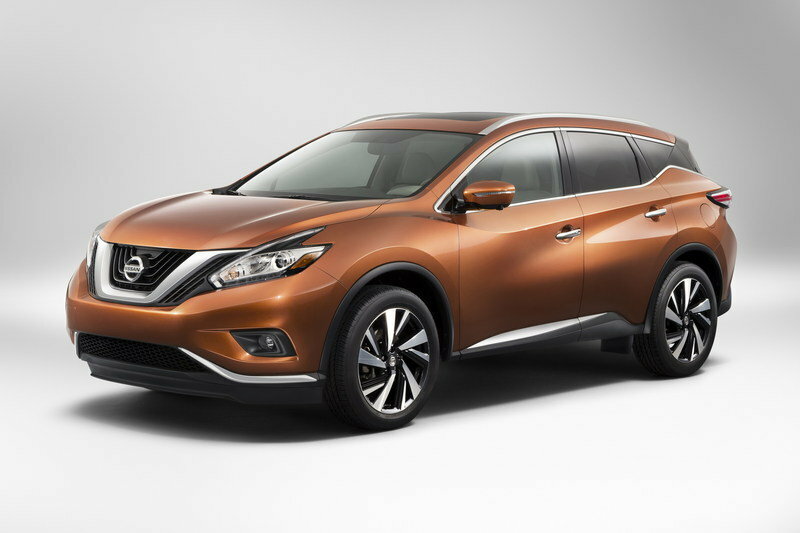 Aside from clear-cut V-shapes, the Murano rides on new 18-inch or optional 20-inch wheels. Plus, it has updated rear lights with new LEDs. 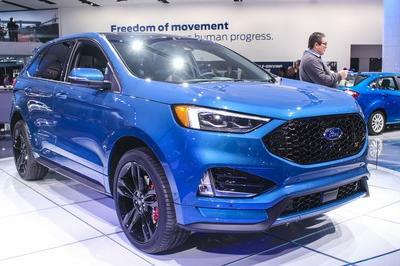 Honestly, looking straight at the back, you can see a bit of the 2017 Ford Escape. Not much, though. Nissan introduced new color couches as well - Mocha Almond Pearl, Deep Blue Pearl, and Sunset Drift Chromaflair. Sounds good, doesn’t it!? I think it looks fine too. Just like this Deep Blue Pearl that is applied to the 2019 Murano you see on these photos. Does the 2019 Nissan Murano Have an Updated Interior? Ok, a bit. 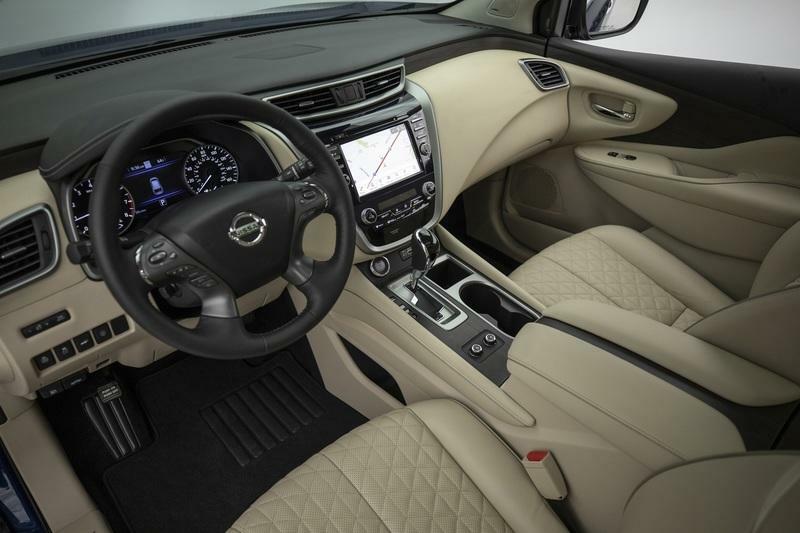 Nissan somewhat redesigned the interior of the Murano only a year ago. While I do not see any novelties for the 2019 Murano interior, I can tell you that the leather on the doors and on the seats can contrast the rest of the cabin on the Platinum models. Apparently, you couldn’t do it like this before. Also, you can choose between the Dark Wood-Tone, the Light Wood-Tone, and the Metallic tone for the interior ambiance. What powers the 2019 Nissan Murano? Well, the Murano is powered by what seems to have been powering it for more than 15 years - a 3.5-liter, V-6 with 260 horsepower that's linked to a CVT. A suite of safety tech will keep you safe and sound in the 2019 Murano. The 2019 Nissan Murano will be offered in four premium grade levels: S, SV, SL, and Platinum. You can probably order it right now, but expect it in showrooms in a month or so. Read our full review on the 2018 Nissan Murano. 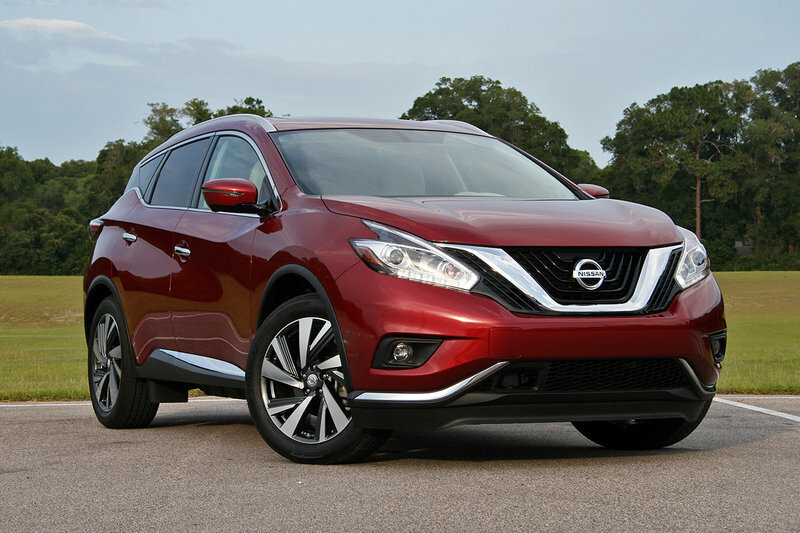 Read our driven review on the 2016 Nissan Murano. The new 2019 Nissan Murano made its world debut today at the Los Angeles Auto Show, offering an early look at the redesigned exterior and refreshed interior prior to reaching Nissan U.S. showrooms in December 2018. "The first-generation Nissan Murano had a profound impact on the SUV market when it was introduced in 2003. As a pioneer of the CUV trend, it offered forward-looking design sensibility that combined an elegant style with premium features – without a luxury price tag," said Dan Mohnke, senior vice president, Sales & Marketing and Operations, Nissan Division U.S., Nissan North America, Inc. The revisions to the popular third-generation Murano’s exterior add a more pronounced front V-motion grille, redesigned LED headlights and taillights, new LED fog lights, new 18-inch and 20-inch aluminum-alloy wheel designs and three fresh new exterior colors – Sunset Drift Chromaflair, Mocha Almond Pearl and Deep Blue Pearl. Enhancements to the luxurious Murano interior are led by new semi-aniline leather-appointed seats with diamond-quilted inserts and contrasting micro-piping trim for the seats, door armrests and center console lid for the Murano Platinum grade. Other changes include three new interior trim finishers: Dark Wood-Tone (Platinum), Light Wood-Tone (S, SV, SL) and Metallic (S, SV, SL). 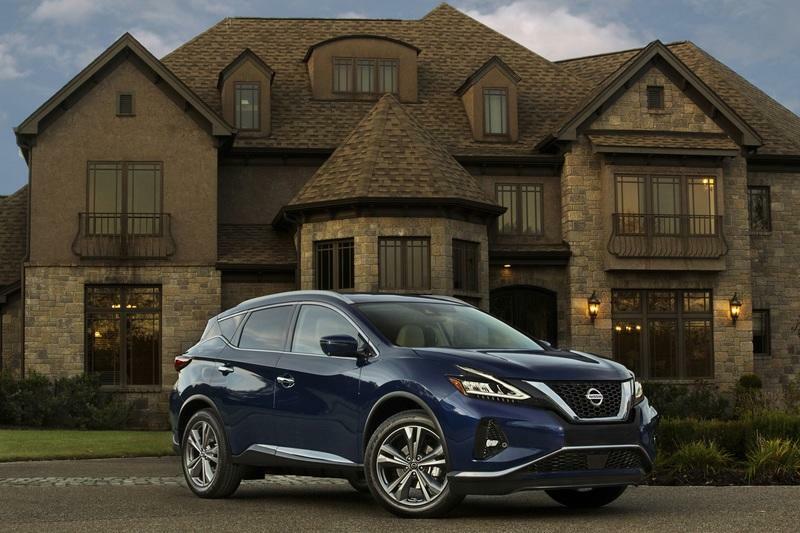 In addition, all 2019 Murano models feature Nissan’s innovative Rear Door Alert and Intelligent Driver Alertness. "From the very beginning, Murano has collected award after award for design, dependability, family friendliness, value and especially quality," added Mohnke. "The enhancements for the 2019 model year are designated for one purpose – to ensure Murano remains in a class all by itself." Safety Shield 360 is a critical part of Nissan Intelligent Mobility, which provides technology in a way that moves people to a better world. Safety Shield 360 includes Automatic Emergency Braking with Pedestrian Detection, Blind Spot Warning, Rear Cross Traffic Alert, Lane Departure Warning, High Beam Assist and Rear Automatic Braking. Safety Shield 360 is standard on Murano Platinum and as part of the SL Technology Package. The 2019 Murano also adds standard 2nd row supplemental side air bags and front passenger supplemental knee air bag. Nissan’s innovative Rear Door Alert (RDA) system is also standard on all 2019 Murano grades. "Nissan Safety Shield 360 is now available on five 2019 models. In addition to Murano, it will be offered on the 2019 Altima, Rogue, Rogue Sport and Maxima," said Mohnke. "Moving forward, Safety Shield 360 will be offered as standard equipment on one million new Nissan vehicles sold annually in the U.S. by 2021." 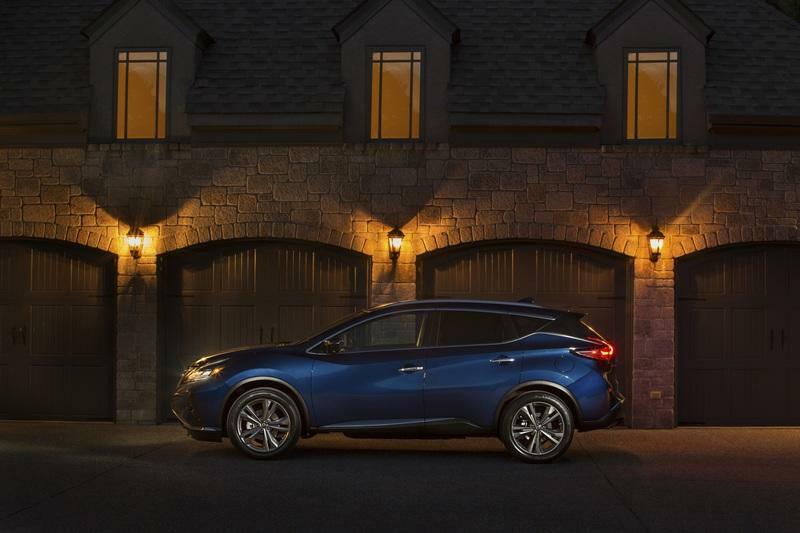 Every 2019 Murano comes equipped with a 260-horsepower 3.5-liter DOHC V6 connected to an advanced Xtronic transmission. Murano is available in front-wheel drive or Intelligent All-Wheel Drive. Also standard on all grade levels is NissanConnect® featuring Apple CarPlay™ and Android Auto™, with 8.0-inch color display with multi-touch control. Murano SL and above grades add standard NissanConnect with Navigation, which is revised for 2019 to include Door-to-Door navigation with 3D building graphics and satellite imagery, online POI search and premium traffic information. The refreshed 2019 Nissan Murano will be offered in four well-equipped premium grade levels: S, SV, SL and Platinum. Just two options are available, the SV Premium Package featuring Power Panoramic Moonroof, Intelligent Around View® Monitor, Bose® Premium sound system with 11 high-performance speakers and more; and the SL Technology Package with Safety Shield 360 technology, Traffic Sign Recognition and Power Panoramic Moonroof.